Massively broaden the scope of any Minifooger for less than £40. Great value. Robust plastic should stand some onstage use. Useful for a variety of pedals. Basic feature set. You'll probably want something more solid for regular gigging. The EP-3 is an essential add-on if you want to get the most out of any of the recently-released Moog Minifooger pedals. "It's a pretty useful thing for any stompbox aficionado to own, as it's a universal expression pedal"
It's also a pretty useful thing for any stompbox aficionado to own, as it's a universal expression pedal that can be used with any musical equipment that supports the use of one. The EP-3 comes with an attached two-metre cable terminated in a jack plug that you plug into the expression pedal input on your pedal. Pressing down on the treadle sends a range of values from heel down to toe down - a knob on the side sets the control range so the pedal gives you either the full range of parameter adjustment, or a proportion of it for, say, a tuned pitch change, or to switch between two delay times. Mainly plastic, it's robust enough for onstage use, and has a smooth treadle action. 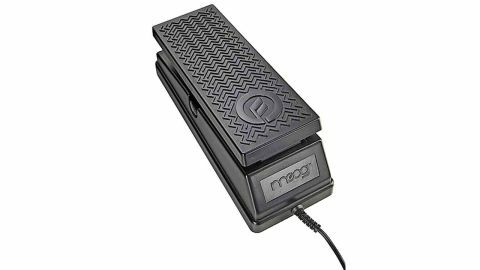 A solid choice for foot control of pedal parameters onstage and off - and the perfect, virtually essential, companion for any Minifooger.